Freely soluble in DMSO or ethanol. Poorly soluble in water.Soluble in dimethyl sulfoxide, ethanol, water, acetone, chloroform, ethyl acetate, ether, methanol and dimethyl formamide. Tacrolimus (also FK-506 or Fujimycin) is an immunosuppressive drug whose main use is after organ transplant to reduce the activity of the patient's immune system and so the risk of organ rejection. It is also used in a topical preparation in the treatment of severe atopic dermatitis, severe refractory uveitis after bone marrow transplants, and the skin condition vitiligo. Tacrolimus was first extracted from the fermentation broth of Streptomyces tsukuba, a soil microbe found in Tsukuba, Japan.1 The name tacrolimus is derived by taking the ‘t’ for Tsukuba, the name of the mountain where the soil sample was extracted, ‘acrol’ for macrolide and ‘imus’ for immunosuppressant. Although structurally unrelated to cyclosporin, tacrolimus shows a similar spectrum of immunosuppressive effects to this agent at the cellular and molecular level. Initial studies indicated that tacrolimus was a powerful immunosuppressant, displaying approximately 100-fold greater in vitro potency than cyclosporin in inhibiting T cell activation. Subsequent in vivo studies have shown tacrolimus to be effective both in suppressing spontaneous and experimental autoimmune disease, and in preventing allograft and xenograft rejection in animal models of organ transplantation. Initially, tacrolimus was used for systemic immunosuppression of patients who had undergone allograft transplants to stop them from rejecting their new grafts. Soon, however, through the benefit of the serendipity of science, it was noticed that tacrolimus could produce favorable results in skin disorders in some of the patients who had undergone transplantation. The discovery of tacrolimus has thus lead to greater understanding of skin pathology, for example of atopic dermatitis. Subsequently, other topical applications of tacrolimus were reported and the use of this agent in dermatology is gradually expanding. It is used after allogenic organ transplant to reduce the activity of the patient's immune system and so the risk of organ rejection. It was first approved by the FDA in 1994 for use in liver transplantation, this has been extended to include kidney, heart, small bowel, pancreas, lung, trachea, skin, cornea, and limb transplants. It has also been used in a topical preparation in the treatment of severe atopic dermatitis. accumulate, either in the skin or blood, following repeated applications. When taken orally, the absorption of tacrolimus is erratic and poor. The bioavailability of the drug ranges from 5% to 67%. 8 Intravenous administration of tacrolimus has resulted in the highest relative tissue concentrations in the spleen, lung and kidneys, followed by heart, skin and muscle, then fat and bone marrow and finally by liver, bone and blood. During topical administration, there is no evidence of cutaneous metabolism. Systemically, tacrolimus metabolism is mediated by the cytochrome P450 3A4 isoenzyme. It is metabolized in the liver, by CYPIA and CYPIIIA. In vitro studies have identified eight different metabolites. When SMS 201-995 is administered via the intraperitoneal route, the effects of tacrolimus are enhanced and thus may enable lower doses of the latter to be used. When administered systemically, tacrolimus is eliminated in bile. It is cleared at 2.25 L/h, with a half-life of 40 h. 1 It has been found that paediatric transplant patients under 6 years old have higher weight-normalized clearance of tacrolimus, as compared with older children and adults. Tacrolimus is a prodrug that enters the T cells and binds to immunophilins, forming a complex that binds competitively and blocks calmodulin. This has the spin-off effect of not activating phosphatase calcineurin, which disables the dephosphorylation of NF-AT and subsequently inhibits entry of NF-AT into the nucleus, suppressing gene transcription. The final result is a decreased responsiveness of T cells to antigens. Tacrolimus can also exert a broad range of immunomodulatory effects on various skin disorders by binding to cell surface steroid receptors and inhibiting mast cell adhesion, inhibiting the release of mediators from mast cells and basophils, decreasing intercellular adhesion molecule-1 and E-selectin lesional blood vessel expression, and downregulating the expression of IL-8 receptor and Fcε RI on Langerhans cells. [11-13] Langerhans cells are considered to be important in the pathophysiology of many inflammatory diseases. There is speculation that the features involved in the activation of Langerhans cells are common with T-cell activation; in other words, there is a dependence on calcineurin in the activation of Fcε RI-specific transcription factor. Tacrolimus may downregulate the expression of FcεRI. Langerhans cells and other CD1a+ skin dendritic cells are important targets of tacrolimus. It has also been suggested that tacrolimus is able to increase levels of p53.2 Topical tacrolimus has been shown to decrease cytokine mRNA levels of IL-1α, IL-1β and macrophage inflammatory protein (MIP)-2, which results in lymph node cell proliferation.16,17 Tacrolimus inhibits the transcription and release of cytokines, for example, IL-2, Il-3, IL-4, IL-5, interferon-γ, tumor necrosis factor-α, and granulocyte-monocyte colony stimulating factor. Additionally, the production of T-helper 1 (Th1) and Th2 cytokines is inhibited by tacrolimus. Owing to its potent activity as an immunosuppressant, tacrolimus has a number of adverse effects when administered orally or intravenously following transplant operations. Nephrotoxicity, represented by elevated creatinine, blood urea nitrogen, hyperkalaemia and reduction of the glomerular filtration rate, as well as vasoconstrictive effects, such as hypertension are among the most serious adverse effects. [19-22] There are also various neurotoxic adverse effects that can occur with systemic therapy. The major ones include mutism, aphasia, encephalopathy, seizures, psychosis, coma and focal disturbances. These reactions have an incidence of 5–10%. [23,24] Minor adverse effects such as headaches, transient, tremors, paraesthesias, photophobias, somnolence and insomnia occur in approximately 20% of individuals. [25,26] Systemic tacrolimus can also cause adverse reactions in the gastrointestinal system, causing diarrhoea, nausea, constipation, anorexia and vomiting. Respiratory disorders such as dyspnoea, pleural effusion and atelectasis, and cutaneous disorders, such as pruritus or a rash may develop. Other adverse effects include fever, pain, peripheral oedema, arthralgia and asthenia. Hypersensitivity reactions may also occur and may be due castor oil derivatives in the parenteral formulation. 1 Ruzicka T, Assmann T, Homey B. Tacrolimus: The drug for the turn of the millennium? Arch Dermatol 1999; 135: 574–580. Lawrence ID. Tacrolimus (FK506): experience in dermatology. Dermatol Ther 1998; 5: 74–84. Michel G, Kemeny L, Homey B, Ruzicka T. FK506 in the treatment of inflammatory skin disease: promises and perspectives. Immunol Today 1996; 17: 106–108. Bieber T. Topical tacrolimus (FK506): a new milestone in the management of atopic dermatitis. J Allergy Clin Immunol 1998; 102: 555–557. Ruzicka T, Bieber T, Schopf E et al. A short-term trial of tacrolimus ointment for atopic dermatitis. N Engl J Med 1997; 337: 816–821. Alaiti S, Kang S, Fiedler VC et al. Tacrolimus (FK506) ointment for atopic dermatitis: a phase I study in adults and children. J Am Acad Dermatol 1998; 38: 69–76. Hanifin JM, Chan S. Biochemical and immunologic mechanisms in atopic dermatitis: New targets for emerging therapies. J Am Acad Dermatol 1999; 41: 72–77. Laurema AI, Granlund H, Reitamo S. Use of the newer immunosuppressive agents in dermatology. Bio Drugs 1997; 8: 96–106. Shirbacheh MV, Jones JW, Harralson TA et al. Pharmacokinetics of intra-arterial delivery of tacrolimus to vascularly isolated rabbit forelimb. J Pharmacol Exp Ther 1999; 289: 1196–1201. Perego C, Lattuada D, Casnici C et al. Evidence that SMS 201–995 enhances the immunosuppressive effect of FK506. Int J Immunopharmacol 1998; 20: 479–490. Fleischer AB. Treatment of atopic dermatitis: Role of tacrolimus ointment as a topical noncorticosteroid therapy. J Allergy Clin Immunol 2000; 104: S126–S130. Wollenberg A, Bieber T. FK-506/Tacrolimus. In: Burg G, Dummer RG, editors. Strategies for Immunointerventions in Dermatology. Springer-Verlag, Heidelberg, 1997: 53–57. Columbo M, Bochner BS, Marone G. Human skin mast cells express functional beta1 integrins that mediate adhesion to extracellular martix proteins. J Immunol 1995; 154: 6058–6064. Panhans-Groß A, Novak N, Kraft S et al. Human epidermal Langerhans’ cells are targets for the immnosuppressive macrolide tacrolimus (FK506). J Allergy Clin Immunol 2001; 107: 345–352. Reitamo S. Tacrolimus: a new topical immunomodulatory therapy for atopic dermatitis. J Allergy Clin Immunol 2001; 107: 445–448. Nagai H, Hiyama H, Matsuo A et al. FK-506 and cyclosporin A potentiate the IgE antibody production by contact sensitization with hapten in mice. J Pharmacol Exp Ther 1997; 283: 321–327. Homey B, Assmann T, Vohr H-W et al. Topical FK506 suppresses cytokine and costimulatory molecule expression in epidermal and local draining lymph node cells during primary skin immune responses. J Immunol 1998; 160: 5331–5340. Leung DYM, Soter NA. Cellular and immunologic mechanisms in atopic dermatitis. J Am Acad Dermatol 2001; 44: S1–S12. Nash RA, Etzioni R, Storb R et al. Tacrolimus (FK506) alone or in combination with methotrexate or methylprednisolone for the prevention of acute graft-versus-host disease after marrow transplantation from HLA-matched siblings: a single-center study. Blood 1995; 85: 3746–3753. Nielsen FT, Leyssac PP, Kemp E et al. Nephrotoxicity of FK-506 in the rat. Studies on glomerular and tubular function, and on the relationship between efficacy and toxicity. Nephrol Dial Transplant 1995; 10: 334–340. Nasr IS. Topical tacrolimus in dermatology. Clin Exp Dermatol 2000; 25: 250–254. Compendium of Pharmaceuticals Specialties, 35th edn. Webcom Limited, Toronto, 2000: 1287–1292. Manez R, Jain A, Marino IR, Thomson AW. Comparative evaluation of tacrolimus (FK506) and cyclosporin A as immunosuppressive agents. Transplant Rev 1995; 9: 63–76. Nousari Hossein C, Sragovich A, Kimyai-Asadi A et al. Mycophenolate mofetil in autoimmune and inflammatory skin disorders. J Am Acad Dermatol 1999; 40: 265–268. Ohashi Y, Minegishi M, Fujie H et al. Successful treatment of steroid-resistant severe acute GVHD with 24-h continuous infusion of FK506. Bone Marrow Transplant 1997; 19: 625–627. Jegasothy BV, Ackerman CD, Todo S et al. Tacrolimus (FK506) – A new therapeutic agent for severe recalcitrant psoriasis. Arch Dermatol 1992; 128: 781–785. An immunosuppressant that blocks T cell proliferation in vitro by inhibiting the generation of several lymphokines, especially IL-2. Shown to inhibit the activity of FK-506 binding protein, thereby reversing its effects on sarcoplasmic reticulum Ca+2 release. 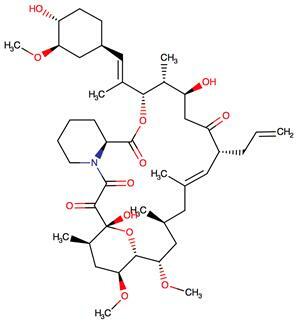 Tacrolimus (fujimycin) was discovered as a potent inhibitor of IL2 production in a targeted search for novel immunosuppressants. Tacrolimus acts by blocking T cell proliferation in vitro by inhibiting the generation of several lymphokines, notably the original target IL-2. Tacrolimus inhibits the activity of FK-506 binding protein, Ca2+-dependent phosphatase and calcineurin, and activates NF-κB through phosphorylation and degradation of IκBα. ChEBI: Tacrolimus is a macrolide containing a 23-membered lactone ring, originally isolated from the fermentation broth of a Japanese soil sample that contained the bacteria Streptomyces tsukubaensis.